The Environmental Health Project (EHP) is a nonprofit public health organization that assists and supports residents of Southwestern Pennsylvania and beyond who believe their health has been, or could be, impacted by unconventional oil and gas development (UOGD, or “fracking”). Partnered with the Environmental Health Project (EHP), a nonprofit public health organization, this project aims to utilize data management tools facilitating analysis on the impact of unconventional oil and gas development on the public health for the Southwestern Pennsylvania and New York. For this project, they have a large number of data sets about citizen health symptoms from local hospitals, and environmental pollution data (air quality, soil quality, etc). They want to develop a data pipeline that can intake their data and join the various data sets at the level of granularity needed, to best understand the impact that polluting facilities have on the health quality of citizens of SW PA. Such a pipeline will allow them to run reproducible analyses on their data sets, incorporating spatial (GIS) data, temporal data, to run models and recommend appropriate environmental health interventions. 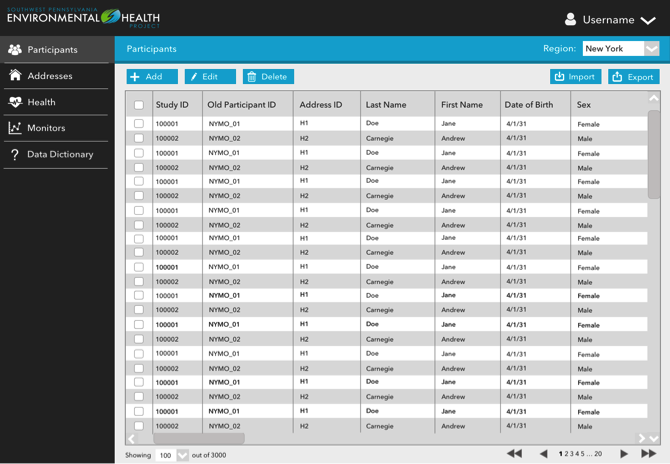 The goal of the project is to develop a real-time, integrated data management system to provide support for data-driven public health analysis and assistance, including manual and machine data collection, database development, data management across multi locations, and data visualization. The project is in the process of developing the database management interface, and integrating the historic data, data collection channels, data dictionary, and data visualization. 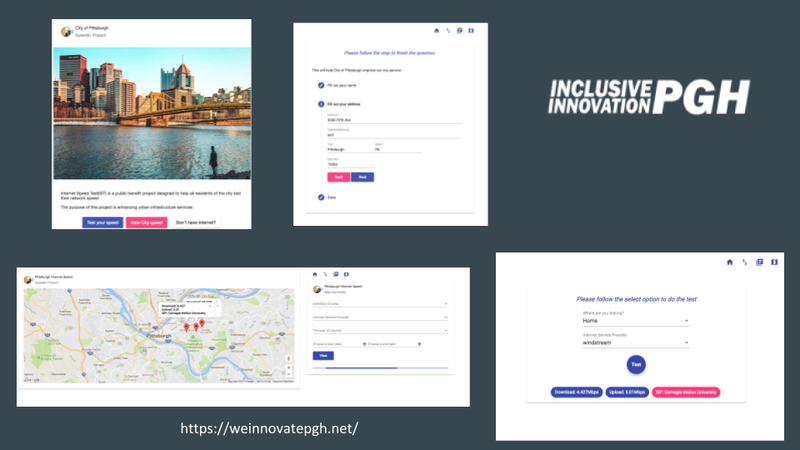 As part of its Inclusive Innovation initiatives, the Pittsburgh Department of Innovation and Performance (I&P) is working to assess the extent of “digital redlining” in the city, before taking action with internet service providers (ISPs). Digital redlining is the phenomenon where ISPs offer reduced internet speeds to various (typically lower-income) areas of a city, while still charging the same rates. Similar to the disproportionate loan rates offered to lower-income and racially-segregated communities throughout the 20th century (‘redlining’), the digital version of this exacerbates existing inequalities by reducing access to information. For this project, I&P wants to run a large-scale data collection of internet speeds mapped around the city of Pittsburgh, to make the case to ISPs that they are engaging in inequitable redlining practices. This may involve adapting code from a related project in Louisville, “Speed Up Your City“, or code may be developed from scratch, depending on the availability of code and the needs of the project. Experience working with internet speed or socio-economic data is beneficial, but not required.